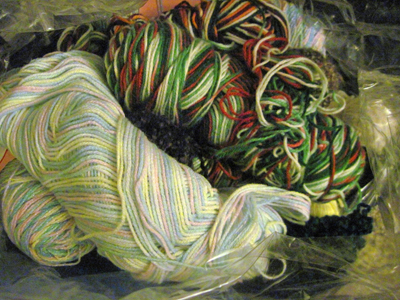 I love yard sale yarn. People bring it to me all the time. My boss gave me a bunch she found at a yard sale. My friend Bruce gave me a ton of it for my birthday. My coworker brought some that didn’t sell at her yard sale. I gladly take it off their hands. The quality? Mostly acrylic. Red Heart type stuff, but it’s great for charity knitting and when I want something that is going to take a beating. I have made pretty neat stuff from the yarn people have given me. So, to all who have given me that yarn, I say thank you. Please, if you come across more, you know someone who will take it! Previous Previous post: Book Review Published! 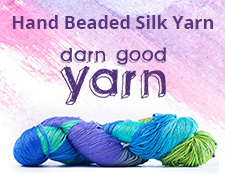 I think it is really refreshing that you don't mind receiving acrylic yarns and are able to find uses for them. I know quite a few knitters who would just turn up their noses. I wouldn't have thought to look for yarn at yard sales. What a good idea!